This is my first attempt at a Center Step Card. I have to say it was really easy and I liked the way this card turned out. 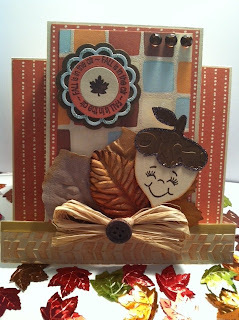 I'm entering this card in some Fall challenges, so I thought this little acorn from Create A Critter 2 with the Peachy Keen Face was adorable. I bought this new Recollections paper pack with all these beautiful Fall colors, couldn't wait to use them. This card was fun and easy, I will definitely be doing it again. Next time I'll have to make a video to show how simple it was. Here's a close up of my card. I added some Studio G Glitter glue around the top of the acorn. I just love the Tiny Doilies Metal Dies from My Craft Spot. I just bought this set of Cuttlebug folders called James'. I used it to get the embossed arrows at the bottom. Make sure you have entered our $100. Joanns Giveaway!! I also wanted to say "Thank YOU" to Carrie & Mimi I won their giveaway prizes! This is really cute. Great use of materials and fall colors. What a pretty card and that acorn is adorable! Thanks so much for joining us at Cut It Up! This is so, so cute! I love the doily sentiment. It's perfect on your card! And the sweet little face on the acorn is a fabulous touch! What a beautiful fall card! Love the colors and that sweet little acorn...too cute! Cute little acorn..great card...puts you in the mood for fall. This card is so stinkin' cute!!!!! I just love everything about it!! I'll have to swing by M's to check out the paper. TFS! wow you did really really good for a 1st try! That's a gorgeous card. Just love all the fabulous embellishments and the leaves!!! This is awesome!!! 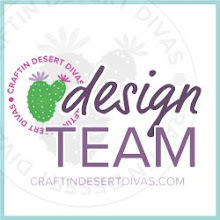 I love that you used My Craft Spot dies!! Great job on this card, I love it. Thanks for playing at My Craft Spot. Super fall card! Love the great design and the cutie acorn! Glad you received your goodies! This is super cute! Love the way it is embellished and the papers are awesome! this is adorable and I love the PK face on the acorn. I really need to make a center step card. You've been my 2nd inspiration this week to try this type of card. Thanks for playing with us at Cut It UP! This is CAUUUUTE!! 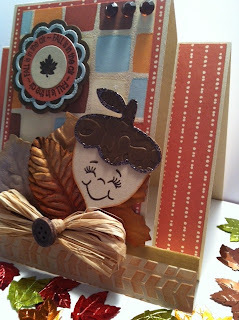 I love all the embossing, pretty paper, and that adorable acorn! The tiny doilies die looks fabulous too! Thanks for playing at My Craft Spot! Love that card! I must have the dies for making that little doily! So cute!! Very cute card!! Thanks for joining us at HIMCR! Very cute card! Love the raffia you added! Thanks so much for joining us at Cut It Up Challenges! So cute, Tara! Such a happy, satisfied acorn! Thanks for entering the Cut it Up challenge this week! Gorgeous card!! Thanks for joining the fun at My Craft Spot! Love your card, its so fun! Thank you for joining us at Cut it Up! What a beautiful card!! I love the design and the adorable acorn!! The face is so sweet! !